Liverpool Sound City is in its seventh year and for the first time has moved from its spiritual home within the centre of the city. Before, the music was irretrievably mixed up in a maze of streets within the heart of Liverpool; the festival turned the already vibrant area into a thronging haven of musical activity, with bands popping up in warehouses and on the street in a metropolitan mezze of musical delicacies to amuse any palate. This year still served up a veritable banquet to satisfy any taste buds, but this time festival-goers needed to travel 20 minutes outside of the centre of Liverpool for the event. 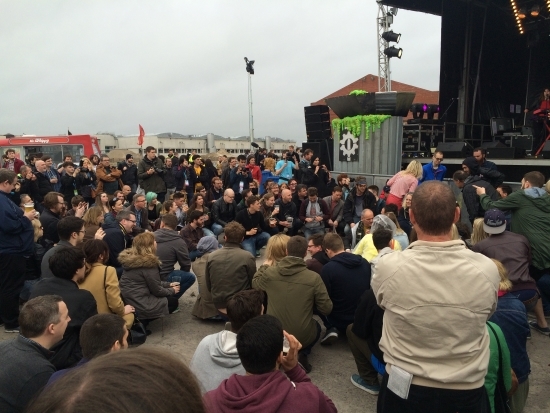 Bizarrely, this report from Liverpool Sound City 2015 comes from the Docklands this year. The setting is quaint, if you manage to block out the industrial sprawl you’ve walked past to get there. One of the unique selling points of Sound City in its earlier guise was its central location. So the decision to plonk it way down the road has left many, including this writer, scratching their heads and with sore feet from walking to the secluded site. Luckily, I found a solution: Liverpool’s version of the ‘Boris Bike’ to get me from the centre of the city where 99% of the hotels are to the festivals site. Again, the site is a departure from the dotting of venues around the city, as now in a more conventional festival manner, each stage is within a set perimeter. My first impression of the actual layout of the site was one of confusion, but in such tight confines, after 15 minutes of ambling around with a dazed look on my face I managed to get my bearings on where everything was. The most striking feature was, understandably, the giant disused warehouse that was being used as The Baltic Stage. The first band up in the vast venue were Barberos, a three-piece from Merseyside, but not exactly one straight out of the textbook. Despite a classic seafront breeze chilling everyone on the docklands to the bone, a rather large crowd had amassed at The North Stage for Francopop artist HollySiz, not least because her outfit left little to the imagination. Immediately, HollySiz had the crowd fixated on her, throwing herself around the stage like a ragdoll. Opening with the inflammatory ‘Tricky Game’, she already conjured up images of your early ‘80s Europop with strong synths and a staccato pace. Bad Meds were next on my port of call (get it, I’m at the docklands and I just said ‘port’) in the setting of the Baltic Stage. Within the confines of the giant disused warehouse, their reverb laden rock sounds utterly enormous and the sheer simplicity of their songwriting works to make the unconverted thoroughly converted. I mean, what’s not to like about songs where you remember how you died in 1995, or that one about how you left a cult? Stay tuned for the second half of John’s day 1 report from Liverpool Sound City tomorrow.